Mediation is a process where a neutral third party, the mediator, helps the parties figure out the issues in a dispute and find an appropriate solution that serves everyone’s needs. The parties make the decisions. The mediator guides and shapes the process. Mediation is private and confidential so it enables the participants to custom design a solution that is appropriate for the people around the table. We believe that most people have the ability to solve their own disputes. We see our role as mediator as that of a facilitator of communication and a guide of the problem solving process. We assist you and the other parties in the conflict or lawsuit in having difficult conversations over tough issues. The earlier mediation takes place the less it costs you in decreased productivity, low morale and inefficiency. Past clients have commented that our “calm approach” enables them to have honest and open dialogues, air their differences and find workable solutions. Ms. Kandell is a certified professional mediator. 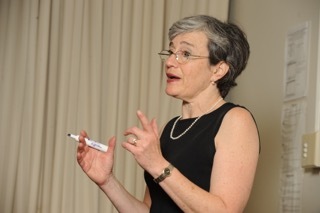 In 2001, she passed a performance based mediator certification, the only such certification in the US, by the Maryland Council for Dispute Resolution. For more information on the mediation process, see Mediation FAQs. You spend more hours at work than at home. Workplace conflicts may range from disagreements among team members to race or age discrimination or sexual harassment complaints under the civil rights laws. 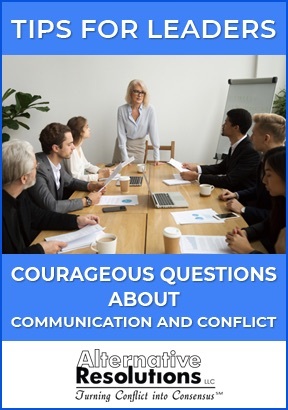 Workplace conflicts can be terribly disruptive, whether you are the employee, the business owner or the agency director. Forty-two percent of a manager’s time is spent on reaching agreement with others when conflicts occur. Moreover, workplace disruptions due to conflict cost an employer 10% of the salary of the employees involved. 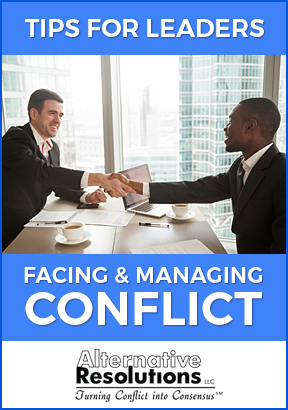 Read about the high cost of conflict. Over the past nine years the Alternative Resolutions team has mediated nearly 1000 cases in Maryland, Northern Virginia and the Washington, DC area, many of which are in the workplace arena. We have resolved numerous workplace cases in diverse workplace settings with employees who are represented by unions under collective bargaining agreements as well as employees in non-unionized settings. We have litigated cases and understand the process. For some cases litigation is necessary. For many cases, however, mediation will produce a more satisfying, less expensive and quicker result. If you have been named in a lawsuit you are no doubt worried about the costs of litigation as well as the time it is going to take you away from your job or your business. Over 95% of cases settle. It’s just a matter of when. Early mediation helps reduce the financial and emotional impact of litigation and increases the likelihood of preserving good working relationships. We serve as a court appointed mediator in Baltimore City and County, Frederick, Howard and Montgomery County Circuit Courts. We have also served in the District of Columbia Superior Court. If you’re looking for a business or workplace mediator to help with civil litigation in Maryland, Northern Virginia or the Washington, DC area, call Alternative Resolutions today. Medical practices, like other businesses, encounter numerous challenges. In addition, they face mounting pressures from managed care to contain costs and must make additional capital investments for the advent of electronic medical records and meet the ever changing federal health care requirements under the ACA. While partnership and healthcare practice agreements contain important details governing corporate compensation they may not address issues such as responsibility for hospital coverage, call schedules, and non-compensated administrative functions. Alternative Resolutions LLC has helped several medical practice groups discuss sensitive issues privately and confidentially in order to resolve conflicts among the partners so that patient care does not suffer and the business of medicine continues unimpeded. Resolved disputes within small and large medical practice groups. Experience on the inside at Adventist Healthcare where we facilitated employee engagement meetings for implementation of improvement plans using the Gallup Q12 Survey of Employee Engagement. You may have been managing the financial affairs of your elder parent under a power of attorney when his or her health was failing. And then a conflict arises with a sibling after mom or dad has passed away. Losing a parent is a difficult and emotional matter. Sometimes lawsuits are filed because the siblings distrust each other and don’t or haven’t communicated directly. One party may believe that a parent’s assets were not handled appropriately. Mediation is particularly well suited to a situation such as this. You can get to the root of the problem and figure out an answer that suits your situation. You decide, not a judge. Based on her experience mediating these kinds of cases Ms. Kandell wrote a chapter in Mediation for Estate Planners: Managing Family Conflict, published by the ABA in 2016. We were selected for the Baltimore City Orphans Court mediation pilot and are also on the roster for the Baltimore and Prince George’s County Orphans Court mediation programs. Having previously practiced law in the trusts and estates field we understand the legal issues that can arise in these cases. Here is one of the numerous articles we’ve written about these sensitive topics in our blog. If you’re looking for an estate, probate or orphans court litigation mediator in Maryland, Northern Virginia or the Washington, DC area, call Alternative Resolutions today. What are their qualifications? Basic mediation training is a 40-hour course but mediators need a lot of case experience in order to be competent. Most professional mediators have taken many hours of advanced training. Find out about the mediator’s training and case experience. Also, find out if they have any specialized expertise or concentrate in a particular subject area. How do I go about finding a mediator? One premier place to look is Mediate.com. Another is to ask friends or trusted advisors such as lawyers or accountants for references. Many mediators are lawyers or social workers so those professional organizations, such as the local bar association, might have a list of mediators. How do I go about hiring a mediator? 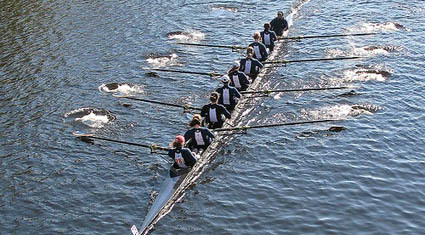 First, both sides to the dispute must agree to resolve the issue or dispute through mediation. Second, both must agree on who the mediator should be. A mediator is a neutral person who does not advocate for any individual party. Is the mediation private? Mediation services are confidential and private. There are some limited exceptions to confidentiality under state law. What is their mediation approach? There are different theories and philosophies of mediation. The mediator should be able to explain their mediation approach.